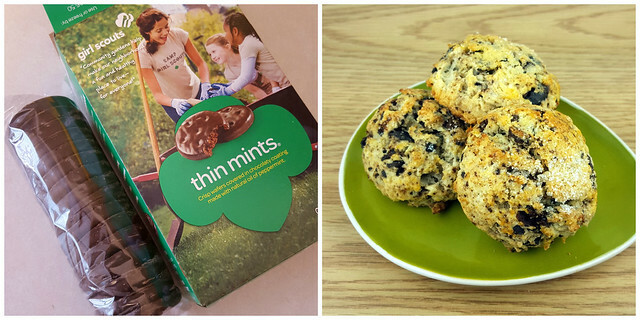 One of the best times of the year is Girl Scout Cookie Season! 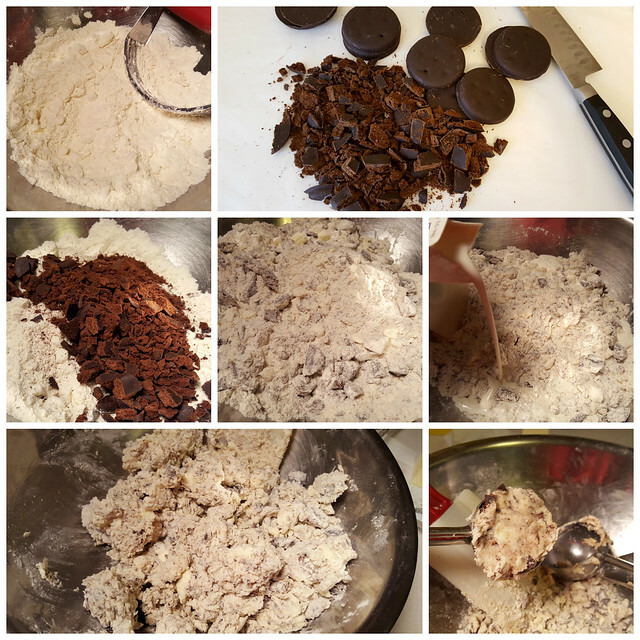 And what better way to bake with seasonal ingredients than to use Thin Mint Cookies!!! 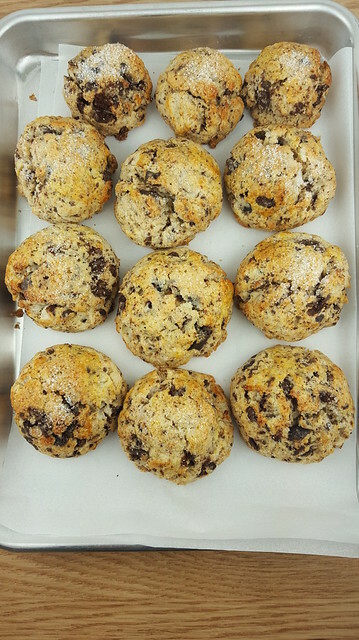 I've made these before, but those scones were square and I wanted to tell you about the ease of scooping your scones. Well, there isn't much to tell. It's EASIER. It's FASTER. It's perfect when you are baking at 4 am! I usually buy 8 boxes of Thin Mints for my "seasonally eating" season! It's really easy to make scones. One bowl and no mixer. Doesn't get much easier than that! Cut in the cold butter - you can use a pastry cutter, two knives or your fingers. Rough chop a sleeve of Girl Scout Thin Mint cookies. The packages seem to get smaller and smaller...I think this package has 16 cookies in one sleeve. Add this to the dough and mix to blend. Then you just stir in some heavy cream and mix together, but don't overmix. I use a scooper to make the scones - sometimes I make bigger scones with a bigger scoop, or more scones with a smaller scoop. You may need to press the dough into the scoop so everything holds together. Brush an egg wash on the scones or you can use some extra heavy cream. I sprinkle some sanding sugar on top, but sugar in the raw or granulated sugar would work too. The "bigger" sugar gives a really nice crunch. This batch has larger scones and a few smaller scones! Something for everyone! Adapted from: Cream Scones from the Art and Soul of Baking (page 152). This is a very good book - find it on Amazon or in your library. 3. Using a pastry cutter, two knives or your fingers, cut in the butter. 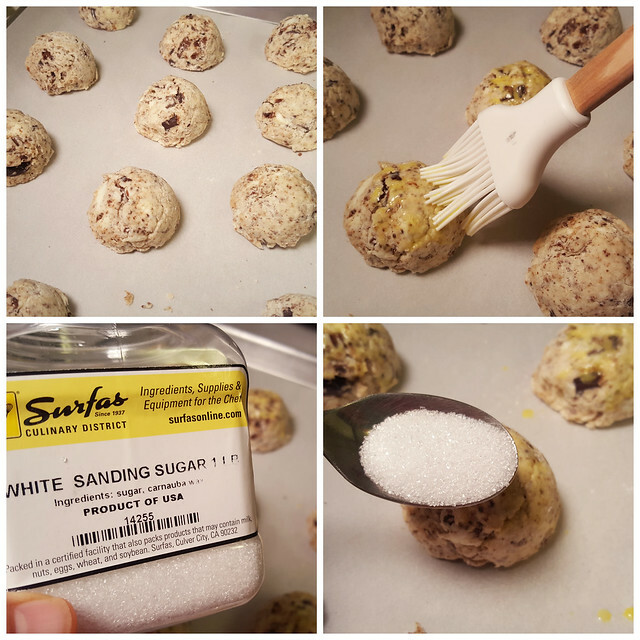 (The book uses a food processor, but I like to make scones by hand...less to clean up!). Add the chopped Thin Mint cookies. 4. Pour in whipping cream. Blend together quickly (I use my hands and/or a spatula). Do not overmix. 5. 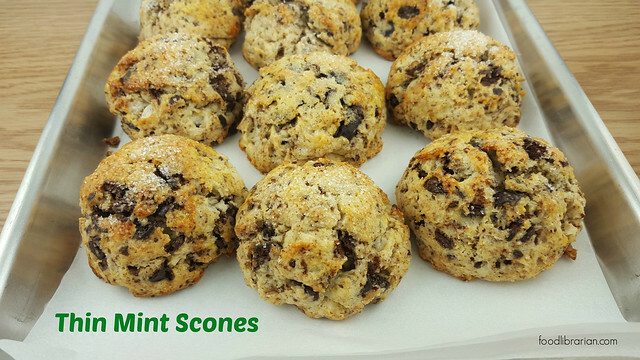 Scoop scones (or you can form into a circle or square and then cut shapes). 6. Place on parchment or Silpat covered baking sheet. Brush with egg wash or heavy cream. Sprinkle with sugar. 8. Bake for 14-16 minutes (depending on your oven and size of scone) until golden brown and delicious.